In fiscal year 2013 (the iPhone 5 cycle),1 Apple’s year-over-year revenue growth slowed to 18%, then 11%, 1%, and 4%; this was a dramatic slowdown from 73%, 59%, 23%, and 27% the year before. Worse, net income growth actually went negative (0%, -18%, -22%, -9%) thanks to a significant drop in margin. As we move ahead into the December quarter, I’d like to review our outlook, which includes the types of forward-looking information that Nancy referred to at the beginning of the call. We have the strongest lineup ever as we enter the holiday season and we expect revenue to be between $89 billion and $93 billion, a new all-time record. In fact, the only record, such that there was, was the size of the miss. So what went wrong? If you will forgive a brief aside, this article requires a few very large caveats: first, Apple has not yet released its final quarter numbers, had its earnings call, or filed it’s 10-Q; there is a lot of information still to come. Secondly, thanks in part to the lack of information, this miss is catnip for confirmation bias: everyone has their pet theory about what Apple is doing wrong or how they will ultimately fail, and it has been striking the degree to which this revenue warning has been breezily adapted to show that said critics were right all along (never mind that many of those critics trotted out the exact same explanations in 2013 and 2016). Third, well, I happen to think that I am right as well: I believe that Apple’s management made three critical errors in their forecast for this last quarter that were predictable precisely because they had made the same errors before — errors that I wrote about at the time. In other words, I am very much susceptible to confirmation bias as well. That noted, if indeed I am right, then that is good news for Apple: I suspect the company is in better shape than the last week of hysteria suggests. In most of the world, Apple is differentiated first-and-foremost by its integration between hardware and software; the company has a “monopoly” on iOS, which allows it to sell its hardware at much higher prices than the competition. However, in China iOS is much less of a lock-in, thanks to the dominance of cross-platform Chinese-specific services, particularly WeChat (WeChat, while the most important factor, is not the only one: indeed, given that Android in China is specifically tuned to the Chinese market by Chinese OEMs, iOS is if anything a hindrance). The net result is that Apple in China competes not on the basis of integration, but rather on the attractiveness of its hardware; in other words, Apple is, to far greater degree in China than anywhere else, simply another OEM. 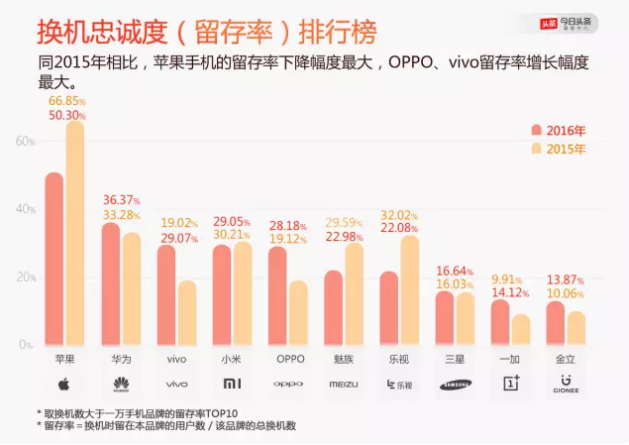 This is still better than the competition, but compared to the 80%+ retention rate Apple enjoys in the rest of the world, it is shockingly low, and the result is that the iPhone has slid down China’s sales rankings: iPhone sales were only 9.6% of the market last year, behind local Chinese brands like Oppo, Huawei and Vivo. All of those companies sold high-end phones of their own; the issue isn’t that Apple was too expensive, it’s that the iPhone 6S and 7 were simply too boring. At the end I concluded that Apple’s next phone — what turned out to be the iPhone X — would return the company to growth in China, and so it did: Apple was up 11%, 21%, 19%, and 16% last fiscal year, after declining by double digits six of the previous eight quarters. The other half of that prediction, though, was that the next ‘S’ model, with only component upgrades in the same form factor, would struggle; that is exactly what appears to have happened. To be sure, there are absolutely other issues in China, particularly the country’s significant economic slowdown as well as the possibility of anti-U.S. company sentiment thanks to the ongoing trade war and the arrest of Huawei’s CFO. I strongly suspect, though, that those macroeconomic factors made what would have been a tough quarter for Apple regardless that much worse; to put it another way, Apple is far more exposed to challenging macroeconomic conditions in China than they are elsewhere thanks to their relative lack of a moat. There are two adjustments Apple needs to make to avoid this error in the future: first, and most obviously, the company needs to be far more pessimistic with regard to its China forecasts in ‘S’ model years. Second, management needs to appreciate that the plane of competition in China is different than the rest of the world: the company is a luxury brand, but only in terms of hardware. If anything, iOS in China needs to cater more to the local market; as far as hardware, perhaps it is time for the ‘S’ strategy to be retired. There is one complicating factor in the last piece of analysis: Apple’s provided their last forecast on November 1, a full month into the quarter; did they not see this massive China miss coming? Perhaps the economy simply crashed in the last two months? This schedule resulted in two blind spots for Apple: first, the company’s FY2018 Q4 results in China were almost certainly artificially high, thanks to Error 1. Of course the iPhone XS should have a strong year-over-year comp to the iPhone 8, but that comp was likely particularly extreme in China. Second, to the extent that iPhone XS sales slowed in October, Apple likely expected the iPhone XR to pick up the slack;2 I strongly suspect the XR failed to live up to expectations. There is, of course, the question of cannibalism: if the XR is so great, why spend $250 more on an XS, or $350 more for the giant XS Max? This is where the iPhone X lesson matters. Last year’s iPhone 8 was a great phone too, with the same A11 processor as the iPhone X, a high quality LCD screen like the iPhone XR, and a premium aluminum-and-glass case (and 3D Touch!). It also had Touch ID and a more familiar interface, both arguably advantages in their own right, and the Plus size that so many people preferred. It remains to be seen the extent to which this is the case globally, but the market where having the flagship matters most has always been China. iPhone XS sales slowing and not being picked up by the just-launched XR certainly explain the timing of the missed forecast. This gets at the third error made by Apple management, and arguably the most concerning: the assumption that iPhone growth is inevitable. I know I’m kind of harping on this point, but in fact I find any possible explanation for this inconsistency very troubling: either Cook was purposely overselling the upgrade narrative last year, which would not only be duplicitous but also dumb, given that he would only be setting up Apple for a fall this cycle; or even as late as last year Cook was out of touch with how the iPhone upgrade cycle actually works, or how it may have changed over time. I strongly suspect it is the latter explanation, and while that is concerning, it’s also understandable; the implication of my ongoing contention that the iPhone has now picked all of the “low-hanging fruit” of growth is that iPhone growth had multiple causes: certainly the inherent quality and new features of each annual iPhone model played a role, but an arguably bigger factor was simply distribution — getting the iPhone onto more carriers in more countries. Indeed, I strongly suspect the predictable impact of increased distribution helps explain why Apple’s earnings forecasts were so eerily accurate for so many years. Apple, though, has been a lot less accurate for the last five quarters: the iPhone 6 sold better than they expected in nearly every quarter, and now the iPhone 6S is selling worse (note the Maestri forecast errors I highlighted above); along similar lines, Apple seems to have underestimated iPhone SE demand to a significant degree. Ultimately, while I think Apple still has the advantage when it comes selling people their second (or third or nth) smartphones, what I think we are seeing is that it’s a lot more difficult to determine when exactly that sale will occur, and Apple itself is only now coming to grips with that. This gets at the rest of the miss — the non-China parts, especially. Cook cited the end of carrier subsidies (largely an old story at this point, to be fair), a stronger U.S. dollar, and customers getting new batteries instead of new iPhones. It’s a bit of a hodgepodge with one primary takeaway: convincing customers to upgrade “good enough” phones is both challenging and unpredictable, and Apple can’t simply assume it will happen at the rate it has previously. To that end, I do question how much longer Apple can afford to stick with the ‘S’ strategy. Again, big screens were such an important feature that it’s difficult to take away too much from the 6S’ poor year-over-year comparisons, but it seems reasonable to wonder if the structural expansions that increased the iPhone’s addressable market papered over the fundamentally weaker value proposition presented by the ‘S’ lines. To put it another way, one could argue the ‘S’ lines are introducing a holiday quarter-like dynamic into Apple’s earnings but on a two-year basis: we may not really tell know the iPhone is doing until a completely new model that will drive upgrades comes out.